Present facts in a visually engaging, cross-curricular learning format to help students quickly and easily comprehend information. 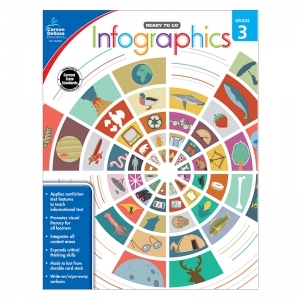 Infographics for grade 1 provides language arts- and math-based questions related to social studies and science topics such as the seasons, ancient Egypt, and more. --Infographics for grade 1 offers a time-saving, cross-curricular solution that supports 21st century learning. Filled with full-color visuals, Infographics for grade 1 illustrates essential facts and appeals to learners. 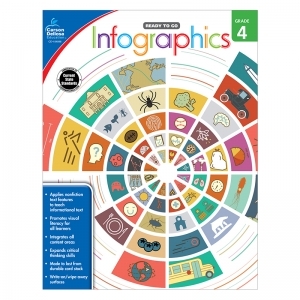 The engaging infographics in this book help students successfully comprehend a large amount of data and answer corresponding questions. With a variety of high-interest science and social studies topics, these infographics are perfect to use individually for skill review or as an instructional resource. Students will learn to use a variety of nonfiction text features such as headings, diagrams, maps, sidebars, time lines, graphs, and more. --The Ready to Go: Infographics series for kindergarten to grade 5 combines math, language arts, science, and social studies into one convenient resource. Students will study infographics on a variety of science and social studies topics and use them to answer related math and language arts questions. The high-interest topics and full-color visuals keep students engaged in practicing valuable skills, from computation to using text features. This all-in-one series supports academic growth through concept application and enhanced critical thinking skills. Present facts in a visually engaging, cross-curricular learning format to help students quickly and easily comprehend information. Infographics for grade 3 provides language arts- and math-based questions related to social studies and science topics such as the moon, the Mayflower, and more. Infographics for grade 3 offers a time-saving, cross-curricular solution that supports 21st century learning. Filled with full-color visuals, Infographics for grade 3 illustrates essential facts and appeals to learners. 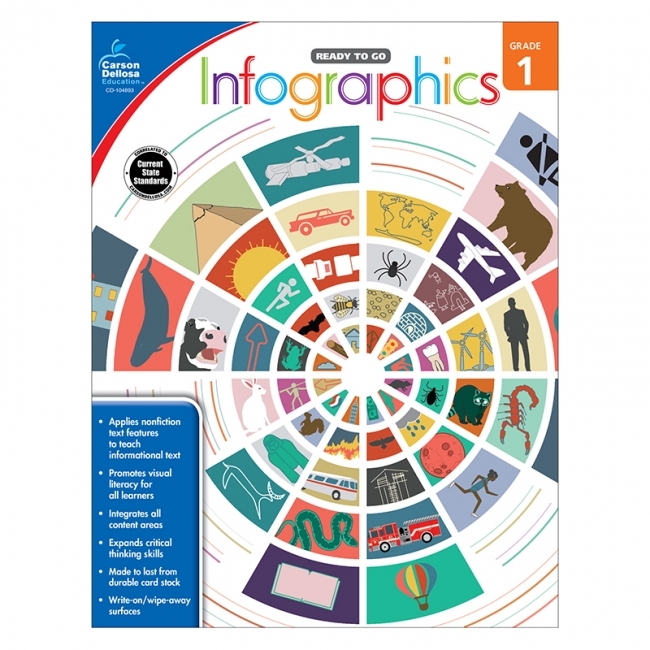 The engaging infographics in this book help students successfully comprehend a large amount of data and answer corresponding questions. With a variety of high-interest science and social studies topics, these infographics are perfect to use individually for skill review or as an instructional resource. Students will learn to use a variety of nonfiction text features such as headings, diagrams, maps, sidebars, time lines, graphs, and more. --The Ready to Go: Infographics series for kindergarten to grade 5 combines math, language arts, science, and social studies into one convenient resource. Students will study infographics on a variety of science and social studies topics and use them to answer related math and language arts questions. The high-interest topics and full-color visuals keep students engaged in practicing valuable skills, from computation to using text features. This all-in-one series supports academic growth through concept application and enhanced critical thinking skills. Present facts in a visually engaging, cross-curricular learning format to help students quickly and easily comprehend information. Infographics for grade 4 provides language arts- and math-based questions related to social studies and science topics such as adaptations, the Supreme Court, and more. --Infographics for grade 4 offers a time-saving, cross-curricular solution that supports 21st century learning. Filled with full-color visuals, Infographics for grade 4 illustrates essential facts and appeals to learners. 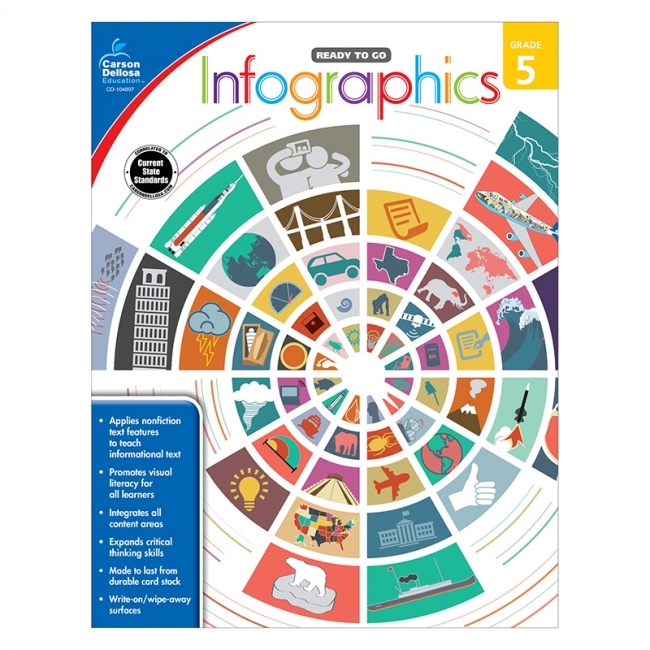 The engaging infographics in this book help students successfully comprehend a large amount of data and answer corresponding questions. With a variety of high-interest science and social studies topics, these infographics are perfect to use individually for skill review or as an instructional resource. Students will learn to use a variety of nonfiction text features such as headings, diagrams, maps, sidebars, time lines, graphs, and more. --The Ready to Go: Infographics series for kindergarten to grade 5 combines math, language arts, science, and social studies into one convenient resource. Students will study infographics on a variety of science and social studies topics and use them to answer related math and language arts questions. The high-interest topics and full-color visuals keep students engaged in practicing valuable skills, from computation to using text features. This all-in-one series supports academic growth through concept application and enhanced critical thinking skills. Present facts in a visually engaging, cross-curricular learning format to help students quickly and easily comprehend information. Infographics for grade 5 provides language arts- and math-based questions related to social studies and science topics like climate change, the solar system, and more. --Infographics for grade 5 offers a time-saving, cross-curricular solution that supports 21st century learning. Filled with full-color visuals, Infographics for grade 5 illustrates essential facts and appeals to learners. The engaging infographics in this book help students successfully comprehend a large amount of data and answer corresponding questions. With a variety of high-interest science and social studies topics, these infographics are perfect to use individually for skill review or as an instructional resource. Students will learn to use a variety of nonfiction text features such as headings, diagrams, maps, sidebars, time lines, graphs, and more. --The Ready to Go: Infographics series for kindergarten to grade 5 combines math, language arts, science, and social studies into one convenient resource. Students will study infographics on a variety of science and social studies topics and use them to answer related math and language arts questions. The high-interest topics and full-color visuals keep students engaged in practicing valuable skills, from computation to using text features. This all-in-one series supports academic growth through concept application and enhanced critical thinking skills. 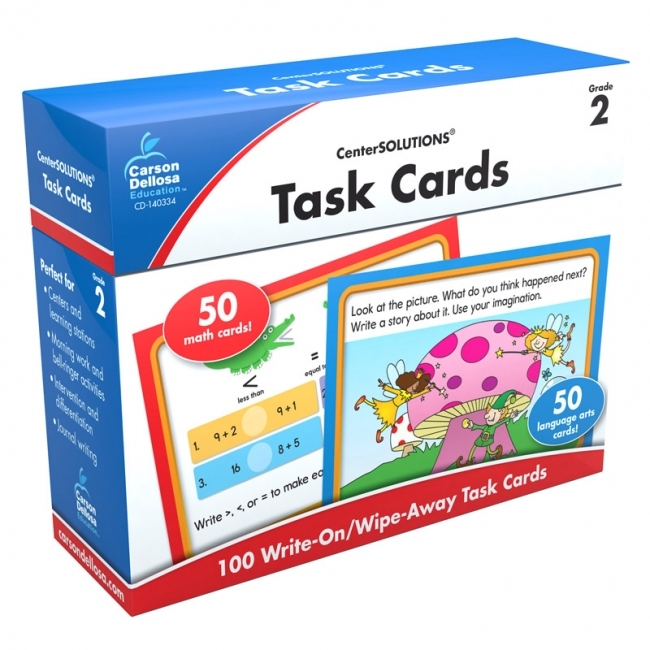 Reinforce the Common Core State Standards for language arts and math with CenterSOLUTIONS(R) for the Common Core Task Cards for first grade. 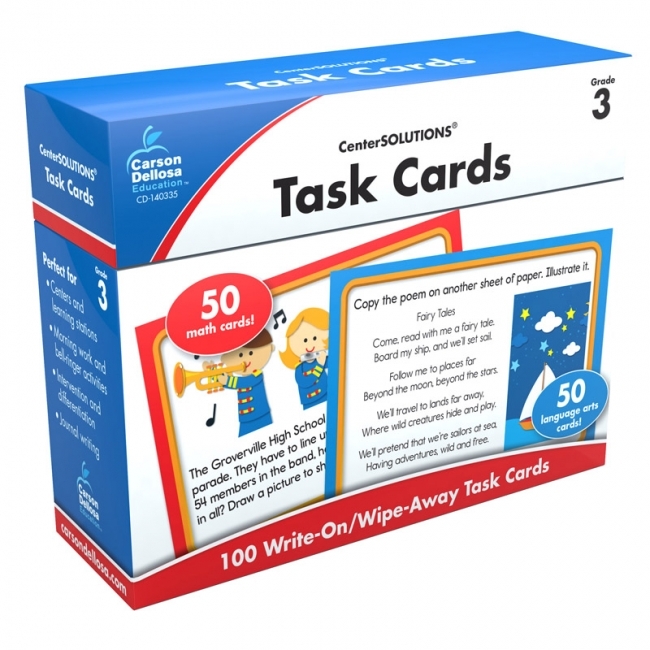 Each write-on/wipe-away card contains critical thinking activities that promote active learning for Common Core success! The set contains 50 language arts cards and 50 math cards, each printed with a standard on one side for easy planning and progress tracking. 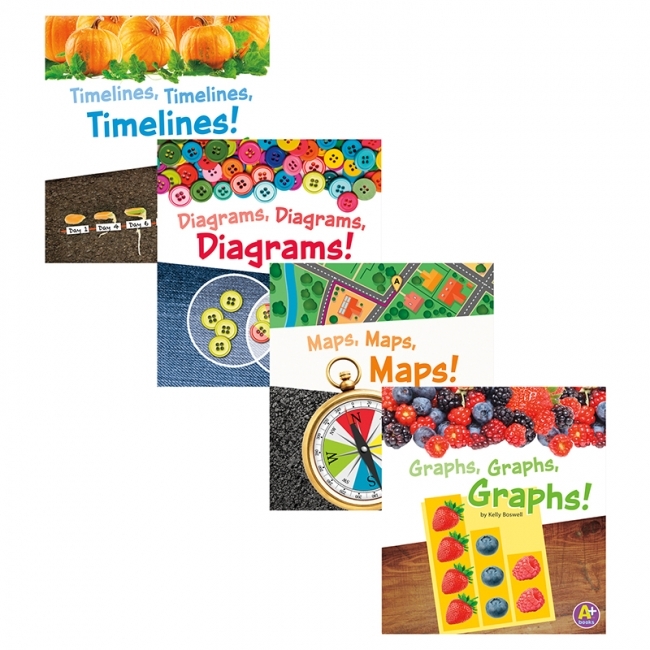 The cards are perfect for centers and learning stations, individualized instruction or skill differentiation, math and reading journals, and much more. The set includes 100 4" x 6" task cards, one introduction card, and one divider. A free online resource guide provides a standards matrix, recording sheets, and an answer key. Reinforce the Common Core State Standards for language arts and math with CenterSOLUTIONS(R) for the Common Core Task Cards for third grade. 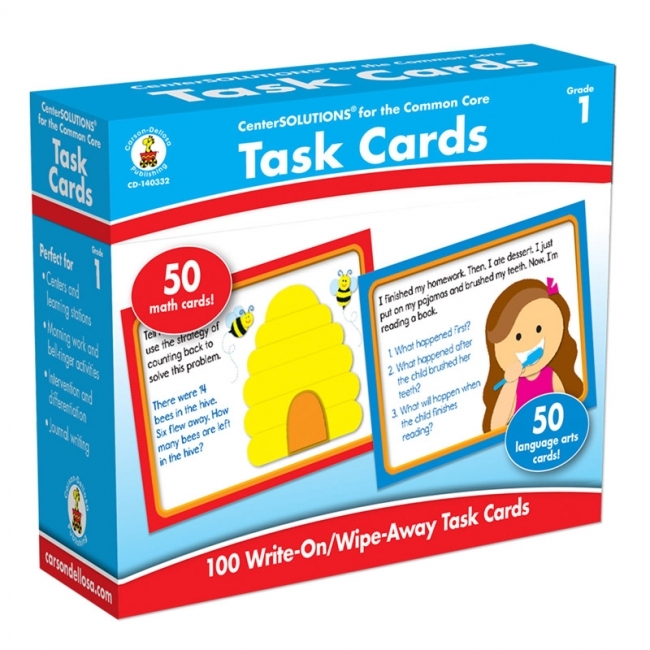 Each write-on/wipe-away card contains critical thinking activities that promote active learning for Common Core success! The set contains 50 language arts cards and 50 math cards, each printed with a standard on one side for easy planning and progress tracking. 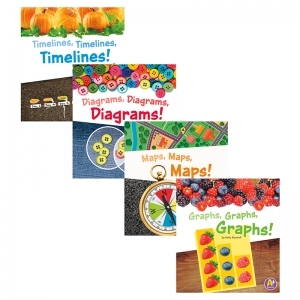 The cards are perfect for centers and learning stations, individualized instruction or skill differentiation, math and reading journals, and much more. The set includes 100 4" x 6" task cards, one introduction card, and one divider. A free online resource guide provides a standards matrix, recording sheets, and an answer key. Help your child master language arts and math with grade appropriate practice that is aligned to state standards. Presented in an effective learning sequence, Spectrum Grade 3 offers rigorous, grade-specific tasks that will help improve your child's academic performance. A favorite of parents and teachers, Spectrum is a trusted series that supports standards-aligned learning to help children reach their full academic potential. 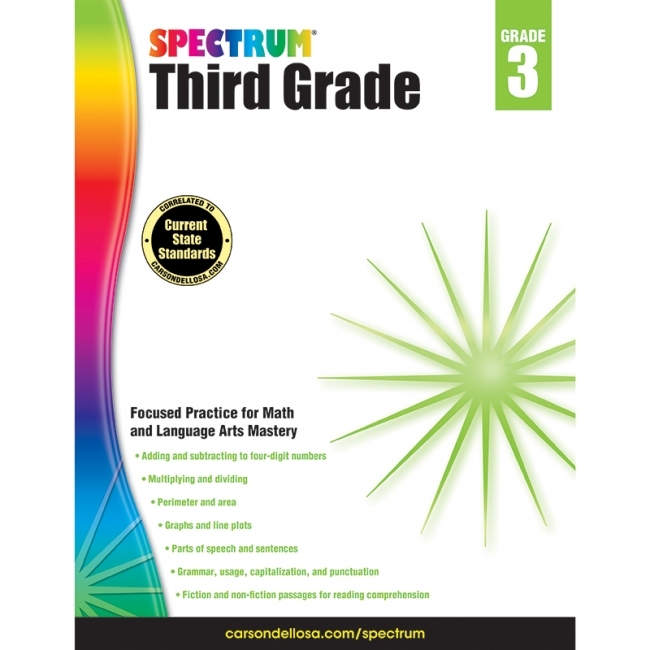 Spectrum Grade Specific for Grade 3 includes focused practice for reading, language arts, and math mastery. Skills include parts of speech and sentences, grammar and usage, capitalization and punctuation, adding and subtracting to four-digit numbers, multiplying and dividing, fractions, perimeter and area, and graphs and line plots. Each Spectrum Grade Specific workbook includes a writer's guide and step-by-step instructions that help children with planning, drafting, revising, proofreading, and sharing writing. Children in grades 1 to 6 will find lessons and exercises that help them progress through increasingly difficult subject matter. Aligned to current state standards, Spectrum is your child's path to language arts and math mastery. Help your child master language arts and math with grade appropriate practice that is aligned to state standards. Presented in an effective learning sequence, Spectrum Grade 4 offers rigorous, grade-specific tasks that will help improve your child's academic performance. 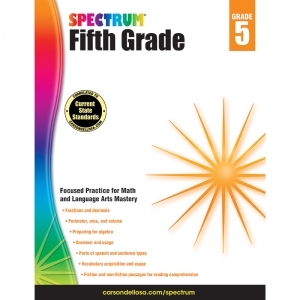 A favorite of parents and teachers, Spectrum is a trusted series that supports standards-aligned learning to help children reach their full academic potential. Spectrum Grade Specific for Grade 4 includes focused practice for reading, language arts, and math mastery. Skills include grammar and usage, parts of speech and sentence types, vocabulary acquisition and usage, multiplying and dividing, fractions and decimals, measurement conversions, classifying geometric figures, and preparing for algebra. Each Spectrum Grade Specific workbook includes a writer's guide and step-by-step instructions that helps children with planning, drafting, revising, proofreading, and sharing writing. Children in grades 1 to 6 will find lessons and exercises that help them progress through increasingly difficult subject matter. 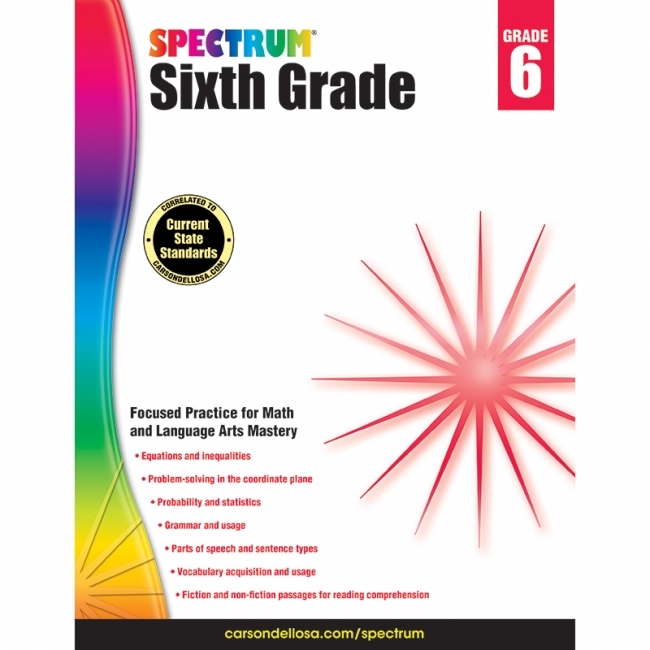 Aligned to current state standards, Spectrum is your child's path to language arts and math mastery. Themed set of Photographic Learning Cards is a great classroom value for speech and language, special education, ESL and ELL programs, Title I programs, Head Start, resource rooms, early childhood, and elementary classrooms. 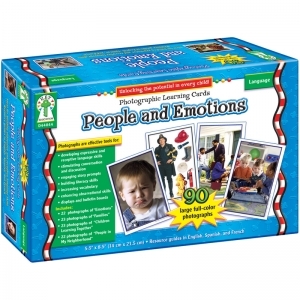 Set includes Emotions, Families, Children Learning Together, and People in My Neighborhood Photographic Learning Cards, for a total of (90) 5.5" x 8.5" cards. Also includes 6 resource guides. Show young readers the many ways you can share and track information. Fun photography and graphic elements inject life and whimsy into data display, while teaching kids the power and usefulness of these important information tools. 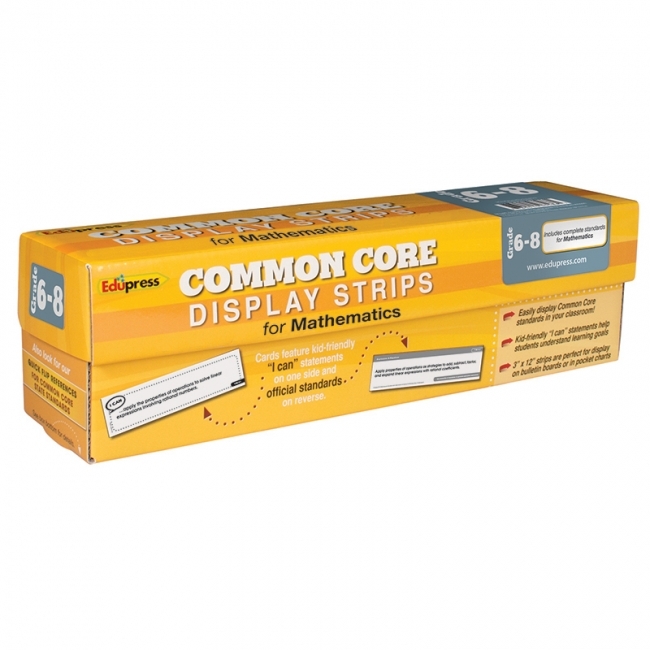 Display Strips offer an easy way for teachers to meet district requirements for displaying the standards in their classrooms. ELA sets include the complete Common Core English Language Arts & Literacy Standards for the individual grade level. 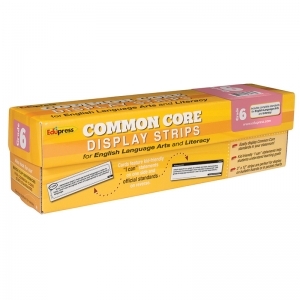 Mathematics combines the complete Common Core Math Standards for Grades 6—8 in one box. Each display strip features the official standard with reference numbers on one side and kid-friendly "I can" statements on the other, making it easy to involve students in meeting learning goals. 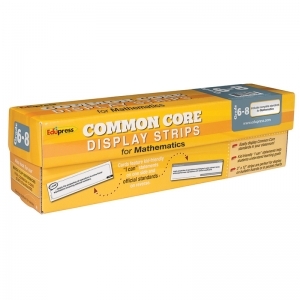 Teachers can display the 3 x 12" strips in a standard pocket chart.